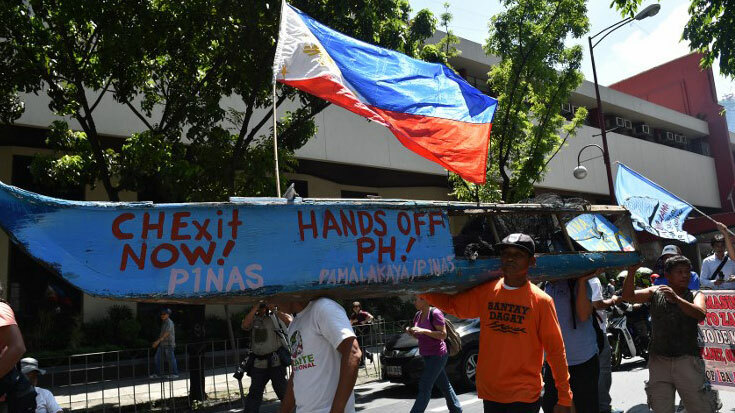 Fishermen from the Philippines, who fish at a South China Sea reef claimed by China, carry a wooden fishing boat in a protest march towards the Chinese consulate in Manila, July 12, 2016. When it comes to the South China Sea, international media have focused in recent months on the conflicts among nations making claims to disputed territory there. That’s understandable when Chinese fighter planes buzz American reconnaissance planes and a Chinese general challenges the United States’ espousal of the freedom of navigation in the sea. But Western scientists say that the vast waterway’s degraded marine environment deserves attention as well. Some say that parts of the marine environment are facing collapse. This is important because millions of people depend on fish from the South China Sea as their main source of protein. U.S. Air Force Captain Adam Greer, whose research has been partly funded by the U.S. National Defense University, says that the stakes in the South China Sea can be summed up by “3 P’s ”— politics, petroleum, and protein. In an article published in The Diplomat, Greer argued that the need for protein derived from fish may be the most important factor driving competition in the South China Sea. As the demand for fish among Asia’s middle class has grown, overfishing has threatened the survival of some fish species, and fish stocks have declined as they have in many parts of the world. Some parts of the waterway’s marine environment, such as coral reefs and the fish which they protect, have come close to collapse. The South China Sea is also a major world trade route and is believed to harbor large deposits of oil and gas. In the past, Beijing has encouraged Chinese fishing vessels to venture far from China’s shores in order to find new sources of fish. Chinese fishing trawlers have ranged as far as the west coast of Africa, where local African fishermen using wooden canoes have been driven out of business because of their inability to compete with larger, faster, and better equipped Chinese boats. In the South China Sea, fishermen have been given navigational devices and for years have received government fuel subsidies, but that practice appears to be coming to an end. The Times cites a Chinese government fishery official’s claim that China is aggressively cutting fuel subsidies for fishing boats and that they will have been cut by 60 percent by 2019. Pending legislation would require that all Chinese “distant-water vessels” be registered, thus making them easier to monitor. Other good news for the marine environment has been a Chinese decision early this year to enforce regulations calling for a halt to harvesting by Chinese fishermen of giant clams in the South China Sea. John McManus, a professor of marine biology and fisheries and director of the National Center for Coral Reef Research at the Rosenstiel School at the University of Miami, says that the decision could mark a major step forward toward helping to preserve and restore a vital part of the marine environment. The decision was announced by China’s southern Hainan Province. The giant clams are embedded in coral reefs that protect small fish from predators. The coral reefs also play a role in replenishing fish stocks. Chinese poachers have used boat propellers to dig up reefs and uncover the clams, causing widespread damage to many of the reefs. Chinese dredging aimed at gathering sand and gravel to build artificial islands staking out China’s territorial claims has caused further damage. The highly valued shells of the clams have been carved much like elephant ivory into intricate ornaments for sale to Chinese tourists visiting Hainan Island. Some Chinese regard the meat from the claims as a rare delicacy and an aphrodisiac. Chinese social media report that some residents of Hainan Island who depended on the clam harvesting and processing to make a living have launched small protests and appeals to the city government there over the closure of their businesses. An image dated April 17 and posted on social media shows an elderly man getting down on his knees in front of two men. According to a caption, the two men are “law enforcement personnel.” The elderly man appears to be begging for mercy. A brief Hainan Daily article posted on the official Xinhua News Agency website says that in the township of Tanmen, the government demolished “illegal buildings” occupying 8,326 square meters of space. The space had originally been designated for farming purposes, it said. Tanmen is well known to Chinese tourists for its giant-clam processing and sales. The Hainan Daily said that buildings belonging to 24 people were demolished. About four weeks ago, on May 10, it said, when the Qionghai City government tried to tear down the buildings, some villagers engaging in “radical behavior” blocked the demolition from going forward. The two committees were apparently the village Communist Party branch and the local village committee. “The battle fortress effect” appears to refer to placing the two committees on the front line in China’s battle to ensure social stability and security. Zhang, an expert on China’s fishing policies, says that the local government on Hainan Island intends to promote aquaculture and fishing tourism among other alternative sources of income for local fishermen. But he says that he sees some evidence that the price for giant clams is rising, which could lead to an underground trade in the clams. The various nations involved in the South China Sea have laws aimed at preserving the marine environment. But the problem until now, Zhang says, has been a lack of implementation.